Here is our answer: YES! There are more lost dogs now. As a nation we are saving more dogs than ever, with many more people choosing adoption as their option. This is a great thing but it comes with it’s challenges. For many people this is their first experience owning a shy, rescued dog. These dogs are often high flight risks and can quickly escape through a door or wiggle out of an ill-fitting collar, harness or slip lead. These high flight risk, shy puppy mill and rescued dogs have many vulnerable moments while they are making their way through the re-homing system. Dogs are lost from transports, foster homes and animal shelters or can be lost from their newly-adoptive homes. There are also more under-socialized pet store dogs than before. Pet store puppies are often taken from their mothers and litter mates far too early, to make it to the pet store market while they are still irresistibly cute and cuddly. 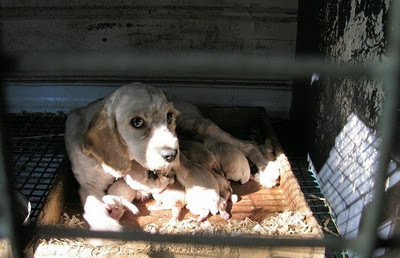 But this deprives the puppies of an important socialization period and can result in a shy, fearful personality. Shy dogs are also being lost from shelters, vet clinics, groomers, pet sitters and kennels in record numbers. Education is the key! Educating people on how to prevent escapes and how to catch a shy, lost dog (don’t chase or call him) will help more of these dogs get home safely. Thank you for spreading the word and helping us!